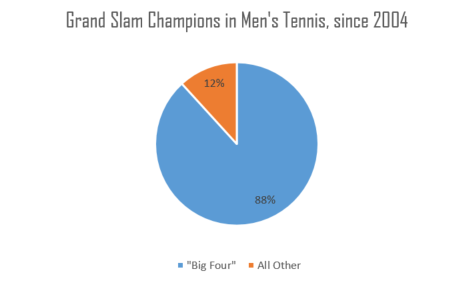 Here are some facts concerning the ample concentration in men’s tennis: since the start of the 2004 season, nine different men have won major championships. In that time, the so-called Big Four of Roger Federer, Rafael Nadal, Novak Djokovic and Andy Murray has claimed 45 of 51 titles, or 88%. Of the other five champions, four only one a single title in that span, two of whom are now retired. The other two, Juan Martin del Potro and Marin Cilic, won their Slams in 2009 and 2014, respectively. 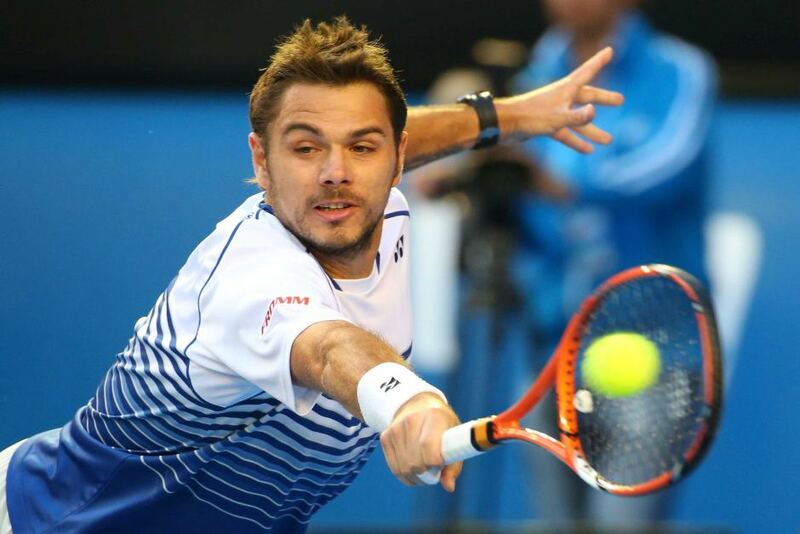 All of which leaves two-time major champion Wawrinka, a curious case. A highly-touted junior player who turned pro in 2002 at the age of 17, Wawrinka claimed his first ATP title in dubious fashion, when Novak Djokovic retired from the final of the 2006 Croatia Open Umag due to fatigue. It would take the Swiss four more years to win his second title, by which time he was already an Olympic gold medalist – albeit in doubles, alongside a peak-form Federer – and a top ten player in the world. While his victory over Rafael Nadal at the 2014 Australian Open wasn’t quite the shock it would seem to be in hindsight, given his heightened level of play over 2013, it did have a certain degree of disruption to it. Nominally a peer of the Big Four, Wawrinka has struggled to gain respect on par with that group. Particularly striking when set against Wawrinka’s resume is Andy Murray’s inclusion in that generation-defining set, despite the fact that Murray has only one more Slam title to his name and is often, if cruelly and unfairly, chastised for lacking the mental fortitude of Federer, Nadal and Djokovic. Currently ranked third in the world, as well as third at the U.S. Open, Wawrinka continues to somehow fly mostly under the radar. Each of his major titles has come at the direct expense of Novak Djokovic. Nadal fell to him at the aforementioned Australian Open. ESPN somehow felt it necessary to ask whether Wawrinka misses his fellow countryman Federer at this tournament, despite his 1-5 career record against him. In a poetic twist, Andy Murray may be the very man most equipped mentally to defeat Wawrinka head-to-head. His victory over the Swiss in the semifinal at this year’s French Open boosted the Scot’s confidence, leading him to the final, where he neverthrless fell to Djokovic. Coming off a shocking Olympic loss to del Potro, a rested Djokovic remains the man to beat. Nadal, too, has taken care of himself this season and could be poised to challenge for his first Slam since 2014. Murray is something of a wild card, or the closest thing to it in this cohort, though one who has found his center and has a tendency to capitalize on mistakes better than anyone else. Federer is, presumably, at home, dutifully composed, perusing Rolex catalogs with measured disdain and walking around in slow motion to a baritone voiceover. Lurking in the shadows is Stan Wawrinka, whose best performances in Flushing Meadows came when he reached the semifinal in both 2013 and 2015. An outlier among outliers, Wawrinka has already left his mark on this era of men’s tennis, his jarringly formidable backhand having brought him to the cusp of true preeminence. He heads into a third round meeting with Daniel Evans having not yet dropped a set at this tournament. By his own account, he isn’t even pushing himself that hard in the Queens humidity. With nothing to lose, and another Grand Slam title to gain, Stan Wawrinka is exactly where he wants to be. The way the public, fueled by the media (including, it must be said, on this blog), views Andy Murray deserves several thousand words in its own right, most of which largely wouldn’t end up having to do with his actual tennis playing. In this way, and in this way only, he shares something in common with LeBron James: they prop him up to be a hero and tear him down when he fails to deliver majors at the historically staggering rate of the other three, yet there are only so many Slam titles to go around. It’s not his fault he was born to play in the same era as the greatest men’s player of all time, Federer, and the greatest clay court player of all time, Nadal, as well as the player who could usurp them both in those roles, Djokovic. START EATING GRASS, ANDY. I clicked, and surprise! He doesn’t. An earlier version of this piece listed Murray as the winner of this year’s French Open, when in fact it was Djokovic who triumphed.